The following research findings demonstrate that one per cent of a population practising Maharishi’s Transcendental Meditation Technique or the square root of one per cent collectively practising Maharishi’s TM-Sidhi Programme radiates a powerful influence of coherence and harmony in collective consciousness, bringing life in accordance with all the Laws of Natur neutralizing negative tendencies, and promoting positive trends in society as a whole. This meta-analysis located in the published literature 107 studies on stress reduction and blood pressure, of which 17 studies containing 23 treatment comparisons among 960 subjects met standard criteria for well-designed randomized control trials in which there were multiple studies for each treatment category for hypertensive patients. 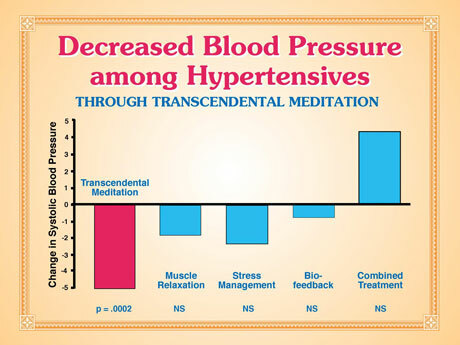 Among these studies, only the Transcendental Meditation Programme was found to have a statistically significant impact of reducing high blood pressure among hypertensive subjects. Reference: Current Hypertension Reports 9: 520–528, 2007. This study was a meta-analysis examining the effect of all published randomized, controlled clinical trials on the effects of the Transcendental Meditation program on blood pressure, comprising nine studies with 711 subjects. The Transcendental Meditation Programme was found to have a statistically significant impact of reducing both systolic and diastolic blood pressure. Reference: American Journal of Hypertension 21: 310–316, 2008. Those who had been regularly practising the Transcendental Meditation Programme showed younger biological age, with a greater reduction in biological age the longer they had been practising the technique. Reference: International Journal of Neuroscience 16: 53–58, 1982. Elderly individuals who practise Maharishi’s Transcendental Meditation Programme, in comparison to controls of the same age, show faster response of the brain to visual stimuli (shorter latency of P300 response). This type of response of the brain usually becomes slower with age, and this finding thus indicates one aspect of the reversal of the ageing process through the Transcendental Meditation Programme. Reference: Psychophysiology 26: S29 (abstract), 1989. A meta-analysis found that those who practise Maharishi’s Transcendental Meditation Programme, in contrast to controls, show outside of meditation a calmer style of physiological functioning, as indicated by lower levels of respiration rate, heart rate, spontaneous skin resistance responses, and plasma lactate. Reference: American Psychologist 42: 879–881, 1987. 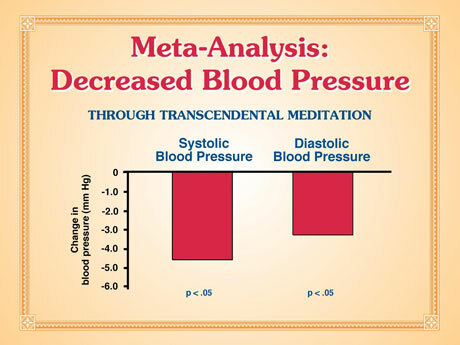 Patients with high blood pressure who learnt the Transcendental Meditation Programme showed a significant reduction of systolic and diastolic blood pressure after three months, in contrast to those randomly assigned to a control technique or to those who received education on how to reduce blood pressure through diet and exercise. Reference: Hypertension 26: 820–827, 1995. The term ‘cardiac syndrome X’ is applied to patients with anginal chest pain and normal coronary angiograms. The twice-daily practice of the Transcendental Meditation Programme significantly reduced incidence of angina episodes, improved exercise tolerance, and increased subjective quality of life in patients suffering from this syndrome. Reference: The American Journal of Cardiology 85: 653–655, 2000. A meta-analysis of all research studies on the Transcendental Meditation Programme related to cigarette smoking, in comparison to meta-analyses of standard treatment and prevention programmes for smoking, found a significantly greater reduction of cigarette use among those who learn the Transcendental Meditation Programme, even though this programme does not involve any guidance about change in lifestyle or habits. Reference: Alcoholism Treatment Quarterly 11: 13–87, 1994. Asthmatic patients who were instructed in the Transcendental Meditation Programme showed significant improvement after three months, as indicated by physiological measurement of lower airway resistance, and by their own personal reports and those of their physicians. Reference: Clinical Research 21: 278 (abstract), 1973. A meta-analysis of all research studies on the Transcendental Meditation Programme related to alcohol use, in comparison to meta-analyses of standard alcohol treatment and prevention programmes, found a significantly greater reduction of alcohol use among those who learn the Transcendental Meditation Programme, even though this programme does not involve any guidance about change in lifestyle or habits. Reference: Alcoholism Treatment Quarterly 11: 13–87, 1994. Those practising the Transcendental Meditation Programme reported significantly reduced use of prescribed drugs (tranquillizers, sleeping pills, antidepressants, and analgesics) since learning the Transcendental Meditation Programme, compared to matched controls. Reference: The International Journal of the Addictions 12: 729–754, 1977. Subjects with high cholesterol practising the Transcendental Meditation Programme showed a significant reduction in cholesterol levels when compared to a control group. There were no changes in diet. Reference: Journal of Human Stress 5: 24–27, 1979. A study of 677 people in Quebec, Canada, who learnt the Transcendental Meditation Programme found that after learning the programme government payments for physicians’ services declined significantly, in comparison to a previously increasing trend. Reference: American Journal of Health Promotion 10: 208–216, 1996. This 14-year Canadian study of annual percentage change in inflation-adjusted government payments for physicians’ services found that 1,418 people who learnt the Transcendental Meditation Programme showed a significant annual decline of 13.8 per cent, relative to matched controls, after learning the practice. Reference: American Journal of Health Promotion 14: 284–291, 2000.